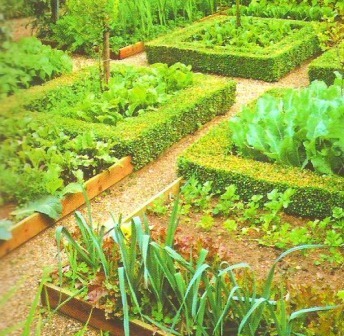 Your vegetable garden layout is an important aspect to consider in gardening. It’s important because it involves the actual planning of your garden appearance. Designing your layout is an excellent start for a successful garden and can also allow you to boost your creativity as well. When deciding the position of your pathways, it’s important to take into consideration accessibility to your garden, the width, as well as movement around it. I mentioned the width because it must be adequate in order for you to easily access your garden tools. Decide if you want to plant in rows or establish raised beds. If you’re going to have a sloping garden, you can create raised beds with shallow retaining walls to prevent soil erosion. The space between the rows should be determined by how you intend on cultivating the soil and controlling weeds. A layout for a small vegetable garden will normally facilitate rows as small as 1 foot apart. If you’re using power tools, the space between the rows must be wide enough so that a tiller can get between them without damaging any plants. The only thing with the tiller is that it cannot easily navigate around curves as well as the plants that are in the middle of the rows. However, long straight rows that are wide enough to accommodate the tiller make the cultivating process pretty easy. Dense plantings in long narrow beds with well evened-spaces promote excellent growing efficiency. They can also be planted into raised beds. You can put your entire garden or just a portion of it into raised beds or wide rows. It doesn’t matter if you’re using transplants or starting from the seeds because raised beds or wide rows are spaced to accommodate the plant growth. As the plants develop, the outer leaves will touch in order to form a sufficient number of dense plants. The good news about this is that the growing area is maximized and the moisture in the soil is well preserved due to the shaded soil. 1. Lay out an area with a width that’s about 3 to 4 feet. The length can be any size you want. The size of the width will be limited by your ability to access the center of the bed from all sides for the purpose of weeding, thinning or harvesting. When determining the length, design the path placement in such a way to cater for easy movement among the beds. 2. Use about 6 inches of manure or compost to cover the area and then dig deeply using a power tool. You can let the bed settle for a few days after digging. 3. Sprinkle the organic materials over the raised surface on the bed. Then rake to break up any clods while mixing it into the top at about 3 to 6 inches. To prepare for planting, use a mild spray to soak it. You can place your plants in clusters at intervals within a row. Ensure that you keep the soil between them and try to keep it clear of weeds. In extremely dry locations, you can change your hill garden by establishing a depression within the ground to collect and store water. Gardening on a hill is ideal for desert areas or locations with hot dry winds. In these types of climates, the plants that are in the middle of a cluster are the ones that may produce an excellent top quality yield. One the reasons are that these plants are the well protected ones. You can design your vegetable garden layout to suit your personal garden needs and situation. An accurate vegetable garden layout is the ground cover for a beautiful garden so it’s good to spend a lot of time perfecting your layout as it will definitely pay off.